Xenograft mice are largely used to evaluate the efficacy of oncological drugs during preclinical phases of drug discovery and development. Mathematical models provide a useful tool to quantitatively characterize tumor growth dynamics and also optimize upcoming experiments. To the best of our knowledge, this is the first report where unperturbed growth of a large set of tumor cell lines (n = 28) has been systematically analyzed using a previously proposed model of nonlinear mixed effects (NLME). 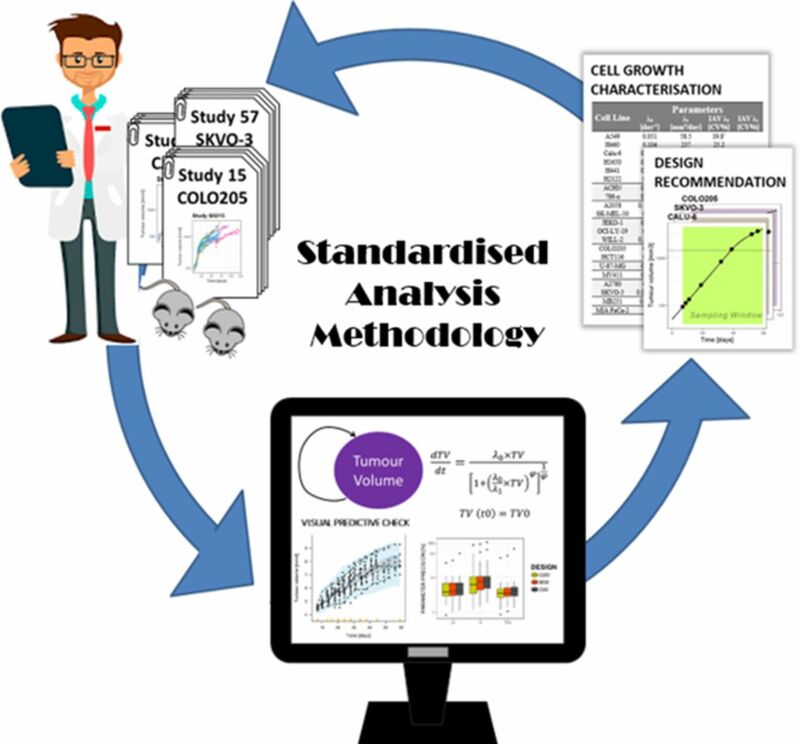 Exponential growth was identified as the governing mechanism in the majority of the cell lines, with constant rate values ranging from 0.0204 to 0.203 day−1. No common patterns could be observed across tumor types, highlighting the importance of combining information from different cell lines when evaluating drug activity. Overall, typical model parameters were precisely estimated using designs in which tumor size measurements were taken every 2 days. Moreover, reducing the number of measurements to twice per week, or even once per week for cell lines with low growth rates, showed little impact on parameter precision. However, a sample size of at least 50 mice is needed to accurately characterize parameter variability (i.e., relative S.E. values below 50%). This work illustrates the feasibility of systematically applying NLME models to characterize tumor growth in drug discovery and development, and constitutes a valuable source of data to optimize experimental designs by providing an a priori sampling window and minimizing the number of samples required. ↵1 Z.P.P.-G. and V.M.-S. contributed equally to this work. ↵2 Current affiliation: Department of Pharmacy and Pharmaceutical Technology and Parasitology, University of Valencia, Valencia, Spain; and Molecular Recognition and Technological Development, Polytechnic University–University of Valencia, Valencia, Spain. ↵3 Current affiliation: Department of Bioengineering and Therapeutic Sciences, University of California, San Francisco, San Francisco, California. At the time the research was performed, Z.P.P.-G., V.M.-S., M.G.-C., and I.F.T. received research funding from Eli Lilly and Company.